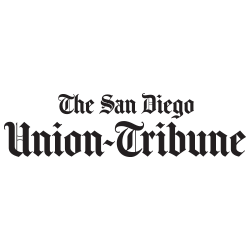 The San Diego Union-Tribune, LLC, owned by tronc, LLC, is San Diego’s most dynamic media company and the region’s most trusted and comprehensive source of local news and information. The San Diego Union-Tribune serves more people in more places on more platforms than any other media company in San Diego. Every week, The San Diego Union-Tribune reaches more than 96% of all San Diego County households by leveraging the combined strength of its integrated media portfolio: the Pulitzer Prize-winning newspaper, The San Diego Union-Tribune; the region’s leading website, SanDiegoUnionTribune.com; the weekly entertainment guide, Night + Day; the entertainment and nightlife website, DiscoverSD.com; Spanish-language product Hoy San Diego and additional home-delivered products. Through its broad coverage of the community and its multiple media platforms serving all audiences across the region, The San Diego Union-Tribune delivers news, information and ideas that improve the quality of life of San Diegans and help make San Diego a better place. For the past five years, PACIFIC San Diego Magazine (PacificSD) has served as the county’s hip, cultural barometer, highlighting the Where, When & WOW! of America’s Finest City. A monthly publication first published in January 2007, PacificSD leads the conversation on the region’s dining, style, fitness, art, culture and entertainment for more than 150,000 progressive, fashion-forward and upwardly mobile professionals. KSDS FM 88.3 is dedicated to presenting Jazz music as a living art by preserving the past, promoting the present and nurturing the future. This is accomplished through high quality programming, production of live events and partnerships with educational organizations. KSDS advances the appreciation and understanding of Jazz with a local, national and international audience while providing outreach for our licensee, the San Diego Community College District, and San Diego City College. KPBS serves our local communities with trusted news and programs that inspire, respect and educate our audience. KPBS will deliver this content via multiple outlets, including television, radio, and digital media and will adapt and remain relevant in a rapidly changing world. SanDiegoVille.com is a hyper-local source for information on all the fun and delicious happenings taking place in and around America’s Finest City – from the shore to the desert, and the hundreds of uniquely vibrant neighborhoods in between. We know San Diego! BLOUIN ARTINFO is the preeminent global source for up-to-the-minute news, information, and expert commentary on art, artists, and the business and pleasure of making, buying, and understanding art. For more than 40 years, Santa Fean magazine has been producing stimulating articles and images that showcase the art, culture, history, personalities, homes, and lifestyles of Santa Fe. The following staff members work diligently to create a sophisticated publication grounded in the spirit of the City Different each and every issue – one that informs, inspires, and intrigues through beautiful and engaging content. MutualArt answers all your collecting needs with a tailored private sales service, underpinned by the world’s most comprehensive art information database and one of the largest private collections of works by contemporary artists. On this site, you will find information about Art Shows and Festivals around the country. TheArtGuide.com is designed to support, promote and encourage the growth of art and spirit of creativity through viewer shared comments, images and posts of current art information. We combine many of the country’s most successful art organizations, museums, local galleries and artists into one comprehensive internet resource. Art fair network for artists exhibiting at juried fine art fairs and art festivals. Info on best craft shows, call for artists nationwide. Vanguard Culture is an online media entity designed for culturally savvy, socially conscious individuals. We provide original interviews and reviews of the people, places and events that make up San Diego’s thriving arts and culture community, as well as curated snapshots of the week’s best, most inspiring and unique cultural and culinary events. We believe in making a difference in the world, supporting San Diego’s vibrant visual and performing arts community and bringing awareness to important social and community causes. Art Business News — The most requested magazine in the art industry, Art Business News reports the latest industry news and emerging trends driving the fine art market. For over 60 years, San Diego Magazine has been giving readers the insider information they need to experience the Best of San Diego®. Written by the city’s most experienced editors, critics, columnists and contributors, San Diego Magazine focuses on issues that directly impact the lives of all San Diegans, and offers readers a definitive guide to events, arts and culture, dining, fashion, travel and the social scene. Subscribe today! For 33 years, San Diego Home/Garden Lifestyles has been deeply committed to strengthening the fabric of San Diego design through award-winning editorial, signature events, and charity sponsorships. ArtScene and art ltd. are pleased to announce our new collaboration, VAS | Visual Art Source, located right here at visualartsource.com. This new site will become your primary source for what is going on in the galleries, museums, and the art world in the Western U.S.
FOX 5 San Diego is the local FOX network TV station proudly serving San Diego television viewers and our advertisers with high-quality news, entertainment, sports and more. Broadcasting locally in high definition on digital TV channel 69.1 and cable channels 705 and 5, the station is known by the call letters KSWB, and our signal began broadcasting in San Diego on September 30, 1985. Southwest Art is the definitive source of information and inspiration for fine art in and of the American West. With excellence as our standard, we champion today’s best emerging and established artists and their works, which vary from traditional representational to more modern styles in wide-ranging media. At Modern Luxury, we know that community, more than ever, defines who we are. And city by city, we make living well an art form. We are the largest local luxury media company, delivering the most affluent audiences in the most prominent cities in the U.S. We bring luxury closer to home, because we live there too. Artblend magazine features artist profiles, current trends in the art industry, art news & events, gallery listings, and informative articles by national & international contributors. Dedicated to art lovers and collectors alike, Widewalls represents an important link between art spaces, artists and collectors, with its ever-growing network of galleries, members’ community, artist database and artworks marketplace. Deeply invested in contemporary art, Widewalls aims to provide a unique experience for its readers in form of in-depth and quality journalism. With strong enthusiasm, it became a pertinent source of information and a relevant platform in producing engaging stories. Always moving forward, Widewalls is the premier contemporary art resource of today. ArtTour International is an award-winning publication dedicated to exposing visual and performing artists to the eyes of art lovers worldwide. It is the go-to international platform for today’s professional and emerging artists. Recognized for the excellent quality of its print publication, ArtTour International Magazine showcases articles of outstanding interest on personalities, trends, and events shaping the art world. The bi-monthly magazine features the best of contemporary Philippine Art and is distributed in international art fairs. Voice of San Diego is a member-based nonprofit investigative news organization that gives concerned citizens the tools they need to engage in important conversations about their community. We are unlike any news outlet in San Diego because we dig deeper to uncover the truth and devote the time necessary to turn the chaos of news into a story people can access and understand. We believe concerned citizens are the true Voice of San Diego and it’s their collective voice we represent in our honest and irreverent approach to reporting. We are building a community of educated San Diegans who dare to ask tough questions and demand answers. Our mission is to support the arts of Laguna Beach and beyond by offering unprecedented editorial exposure and distribution to a thriving art scene.